Look what I found at my favorite antique mall today. It’s of course supposed to be for beverages. But here it will house potted plants. I picked up an asparagus fern while I was out as well. My cement guy’s locks are starting to grow. Soon he will have a whole head full of “hair.” Which are actually golden pennies. The clematis vine is growing in leaps and bounds. I just love the white clematis flower. 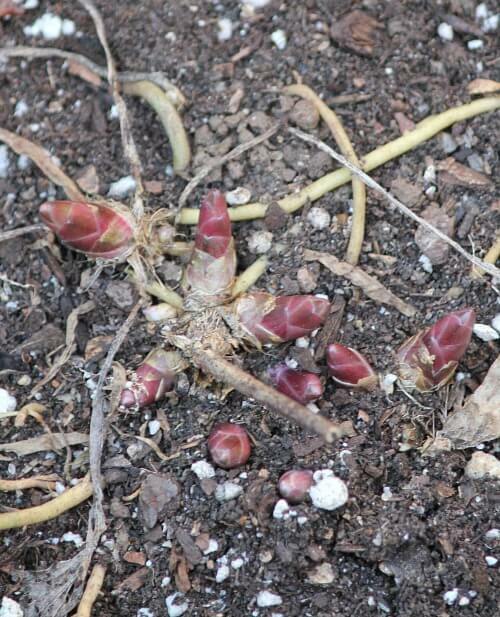 These are the beginnings of one of my various hosta plants. 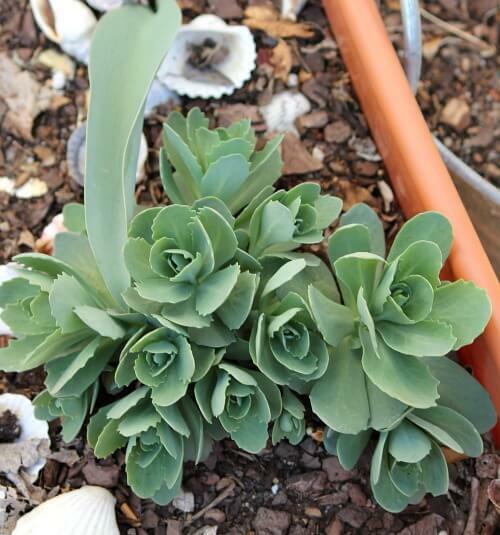 Above is sedum autumn joy, sent to me by a reader in California. 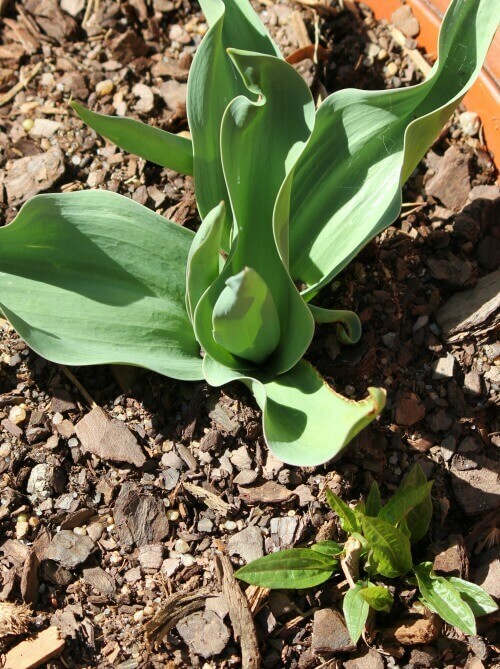 Here are tulips that are about to bloom. And daisies are a few inches tall. Are plants coming up in your garden yet? It all looks so pretty. 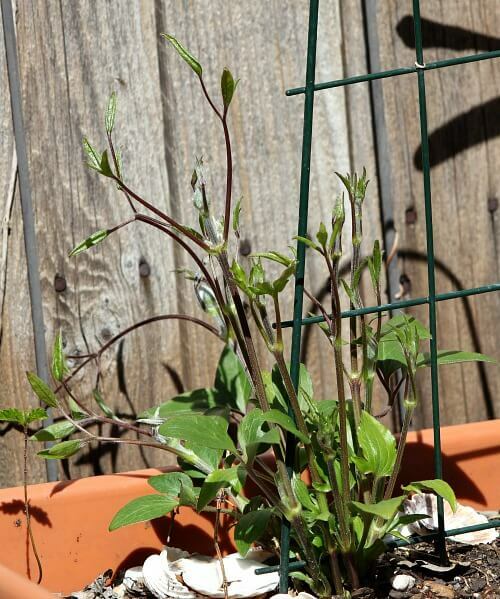 This will be the first year I grow Clematis. Sedum is my favorite and so easy. Hi Brenda! Oh, I know you're thrilled that your little plants are popping up their little heads! Woo hoo! Love that red container. Have a nice weekend. Yes, those are your hostas coming up. I need to check mine. We had the strangest weather yesterday with a brief snowfall. It got really cold, too and now back to nice weather. Love the new red tub! No plants coming up. It is snowing in Minneapolis, land of turtlenecks and thick socks. I have some sedum coming up! Otherwise I need to get some new plants this year. Your garden looks great, love the big red tub! We got alittle bit of everything popping up. I have yet to plant any annuals for fear one last dozie of a cold spell. I generally wait till april anyways. happy weekend! It's very warm here and my Azaleas and Camelias are both blooming. I started a little garden on one side of my potting shed. I will be extending it this weekend. 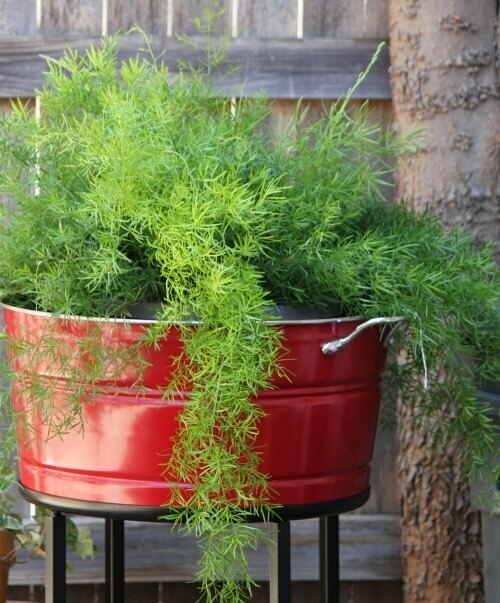 I like your Asparagus Fern. There is some planted in the ground in my yard and it does just fine all year round. Of course, it's a bit warmer here than in Tulsa. Enjoy your weekend! I an a little envious of all the green on your patio! It's still too cold here in Idaho to have anything pop out of the ground. I do love Clematis, my daughter has one that is always so beautiful. I can't wait to see your little head full of "hair"! Very pretty! Your garden looks beautiful. Love your new red pot . It made the perfect flower pot. we still pretty chilly, so no flowers yet. It's so nice to see some spring flowers blooming! Ours are a long way off, although the forsythia may be early this year, because we've had a mild winter. The only sign we've had so far are the daffodils just starting to break through the soil. Bluebonnets! Telling everyone that I spotted my first bluebonnets in bloom today on I-30 between Arlington and Ft. Worth, TX. Now, I'm planning to go looking for bluebonnets closer to my house. Just like the first robin is the unofficial sign of Spring in the north, blooming bluebonnets are the unofficial start of Spring in Texas. Things are popping up all over here in central TX too. 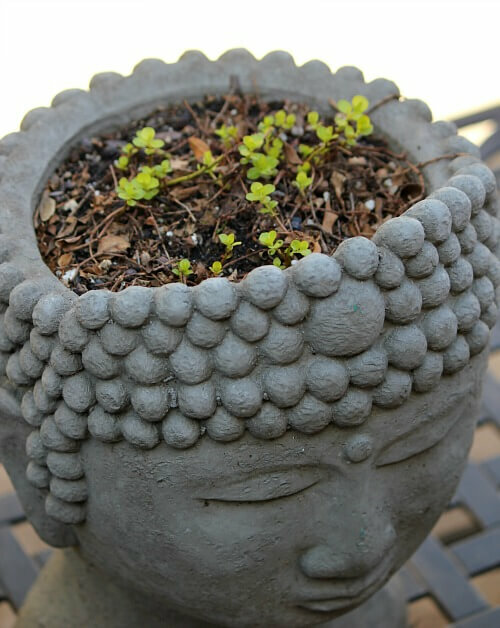 Your cement guy is a Buddha head, I like it! I can't wait to see the plants poking through the ground, but unfortunately it will be another 2 1/2 months at the very least before it happens up north. Enjoy your gardening! Good morning Brenda. I featured your blog on Shout Out Saturday today. Enjoy your weekend. Yep, my plants are starting to come up too! yay! I love your red bucket and the cement guy too! Your garden is looking a whole lot better than mine. I'm loving that red tub! I always have some asparagus ferns planted in some of my pots, too, but I don't think they have anything out for sale yet. It's a little too early, but it won't be long! Can't. Wait. Love your new plant holder – gorgeous! That looks like creeping jenny coming up as 'hair' – I seriously can't believe how much farther along your garden is – winter is clearly over in your neck of the woods!! Not here – it's cold today and there's some snow coming this afternoon. Nothing yet as we are still buried in snow but it's wonderful to see spring starting somewhere. That tells all the northerners that spring will eventually make its way up here! I love clematis vines as well, along with my lavender, hostas, hydrangeas,…I love anything that is green and comes out of the ground. I find plants and gardens to be such relaxing places to spend time. So lovely to sit down on a comfortable lawn chair and to watch and listen to the birds. Come Spring, come! I think Spring has found your house! Yes, I'm starting to see plants push through the ground outside and getting ready to flower this Spring. It's a wonderful sight! Thanks for sharing green. Wyoming is still a dirty white. March, April and are the months when I miss east Texas. My herbs are in a galvanized tub/drink cooler from Dollar General. In Fl…things always growing…but time to refresh my window boxes . Spring is so early thins year, isn't it? I have tulips popping up that we don't usually see until April.